Celebrate the 5th Friday with dancing to the live Balkan music of Da! Mozhem. We meet at Lincoln Park Presbyterian Church, 31st Ave. and Clement St. Enter on 31st Ave.
$5 plus tips for the band. Bring snacks to share. Da! Mozhem plays and sings high-energy pan-Balkan music for the joy of dancing. D!M is a group of friends who have been playing together for well over a decade. 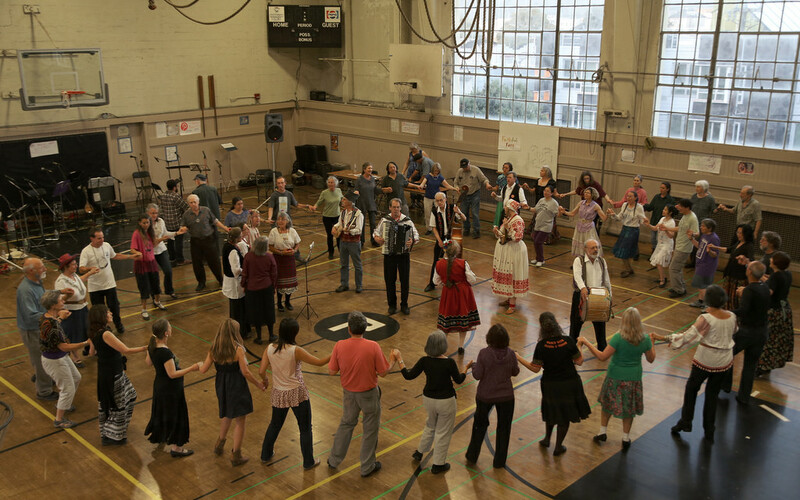 The group has veterans from many excellent folklore bands such as the People’s International Silver String Macedonian Band, Born to Drone, Westwind, Sviraci, and the Slavonian Traveling Band. The band plays with emphasis on Bulgarian, Macedonian, and ex-Yugoslav traditions. Several members frequently travel to the Balkans to learn more about the folkloric music of the region. The group plays on traditional instruments unique to the region as well as modern instruments. 31st Ave. and Clement St.